SallyStrawberry: Learn to crochet: the kit- you will be surprised by how little you actually need! 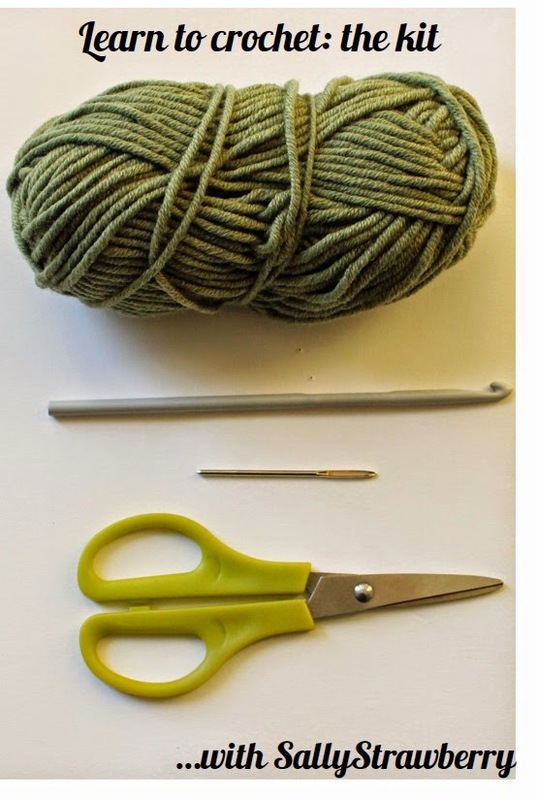 Learn to crochet: the kit- you will be surprised by how little you actually need! Hello and welcome to my new 'learn to crochet' blog series. This series will provide beginner crocheters with all the instructions they need to get crocheting. I have been teaching crochet classes for a year now but unfortunately in recent months, due to various circumstances I have been unable to hold classes. I generated a plethora of teaching materials for my classes, and I don't want them to go to waste. Therefore, I will be converting my materials to blog posts for you all to benefit from. I hope you like them and find them useful, but please please let me know if there is something you don't understand and I will try and help you out. Equally, if my posts don't cover something you are desperate to know, get in touch and I'll see what I can do! That is pretty much it to get you started. There are other things which can be useful, such as stitch markers and a ruler/tape measure but these are the absolute basics. You can pick hooks up for less than £1 in some shops and depending on the quality of the yarn you choose, you can pick up some real bargains here too. Before you get carried away one quick point about yarn weight and hook sizes. The hook size you choose (usually marked in millimetres in the UK, and letters/numbers in the US) dictates the amount of yarn used in a stitch (so in effect the size of the stitch)- the bigger the hook the more yarn and the bigger the stitch, and the wool weight will effect the density of the resulting crochet fabric- thicker wool= a denser fabric. Therefore, it figures to use a hook size appropriate to the yarn weight. I will talk about this in more detail later but just to get you started I would recommend using a double knit (DK) or aran weight yarn when you are learning, with a 4mm (US size 6 or G) or 5mm (US size 8 or H) size hook respectively. This is a guideline only, but will do to get you started.